Our list of the best toys for 1-year-old boys! With all of that being said, it’s important that you strike the right balance between aesthetics (how the toys look), utility (what function do they do for your kids, i.e. what do the toys accomplish), and affordability plus availability (are they easy to purchase/affordable to buy). Most importantly however, your kids should love and love to play with their toys. Now that we know what to look for in toys for 1-year-old boys and girls, let’s examine each of these factors closely. Again, toys should be suitable for children under 3 years of age. What does this mean? Firstly, you should steer clear of older toys. Older toys may have a sentimental value (and are less expensive as well), but they probably don’t meet current safety standards and are most likely worn out from extensive wear and play. Worn out toys can easily break and can become hazardous before you even know it. Secondly, make sure a toy isn’t too loud for your children. Some toys like squeaky toys, rattles, electric cars or robots can be very loud (even comparable to a car horn), which can lead to hearing loss if handled improperly. Thirdly and finally, make sure the toys are unbreakable and able to withstand extensive chewing. Boys and girls aged 3 or less have an affinity towards chewing objects and toys, mainly because this is their way of getting familiar with the world at this young age. To this extent, avoid toys with sharp edges, toys with strings longer than 7 inches (18 cm), and toys that could potentially pinch small fingers. According to the latest U.S. Consumer Product Safety Commission (CPSC) regulations, toys should be large enough so that they can’t be accidentally swallowed or become stuck in the windpipe. The general rule for toys dimensions for children aged 3 or less are as follows: 1 ¼ inches (3 cm) in diameter and 2 ¼ inches (6 cm) in length. You should also avoid coins, marbles, and balls that are 1.75 inches (4.4 cm) in diameter or less, since the round shape can easily get stuck in the throat above the windpipe and make breathing impossible. To test if a toy is appropriate, you can use a so-called small-parts checker – otherwise known as a choke tube. These tubes are specifically made to have the same diameter as a child’s windpipe. If a toy/part of a toy fits inside the tube, then it’s not appropriate for young boys and girls. Additionally, make sure to avoid toys with small parts such as eyes, buttons, or wheels that can be easily pulled loose or torn off from a toy. All materials on toys should be labeled as “nontoxic”. Drawing toys such as crayons and other paints should say ASTM D-4236 on the packaging, meaning they’ve been tested for safety by American Society for Testing and Materials. Fabric toys should be labeled as flame retardant or flame resistant. Paint on all toys should be free of lead (stay clear of older, hand-me-down, or handmade toys, as these kinds of toys may not have been tested for material safety). Avoid painted toys made before 1978, as these may contain lead or traces of lead in the paint. Play is an opportunity for kids to open their imaginations, improve their creativity, develop their communication (verbal and non-verbal) skills, practice cooperation, and more. In fact, according to the latest pedagogical research, children are changing the meaning of toys during play, which can serve as an important pivot point to teach 1-year-old boys and girls about real-life activities that reside outside of games. Many leading experts define creativity as the ability to combine previously unseen or unrelated objects/concepts in order to solve a problem. To this extent, you should consider toys with vivid and splashing colors, various shapes (excluding small rounded shapes due to safety concerns), and generally toys which, again, stimulate creativity and spark the children’s imaginations. There are two types of motor skills: fine motor skills (writing with a pencil) and gross motor skills (throwing a ball in the air). You should aim for toys which stimulate the development of both fine and gross motor skills in your children. Other important skill developments you should consider are as follows: dexterity, pincer action, hand eye-coordination, visual tracking, and more. It goes without saying, but it’s important to remember that toys should be affordable regardless of your family income. This is important because all children should be able to have the same access to toys which would enable them normal growth during the course of their childhood. Some would argue that this falls under the free market rules: meaning anyone is free to buy anything as long as their budget allows. However, consider the rules of supply and demand. Roughly speaking, if fewer families buy very expensive toys, then the demand for these toys will drop, with supply following closely. Of course, there are numerous factors at play here (including complex laws of economy), but you get the gist of things. With all of that out of the way, let’s see which toys would be the best for your 1-year-old boys and girls to purchase. Mega Bloks is the perfect toy to spark your 1-year-old boy’s imagination the easy way! In fact, there’s no better way to introduce your 1-year-old son to the world of creativity than to buy him his first set of Mega Bloks. Mega Bloks is the equivalent of Lego but for babies and toddlers. This is an ideal choice for a birthday gift because it will improve hand-eye coordination as well as motor skills. 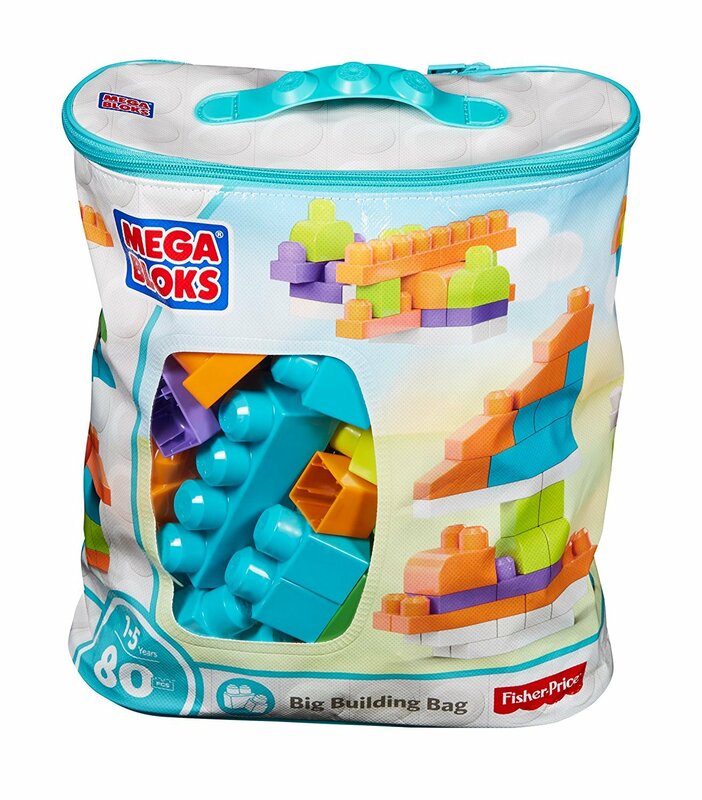 On top of that, Mega Bloks features playing blocks with smooth edges and a variety of shapes and colors, which are also very easy to plug and unplug for the ultimate creativity boost. Finally, this product will provide your son with many days of enjoyment and turn him into a little engineer. Has 80 jumbo blocks that are easy to hold, especially for small hands. Comes with a big bag, making storing all the pieces easier. Improves coordination and motor skills. No user guide or manual is included. To a 1-year-old, bathtime is never seen as the time of day to wash all of the day’s activities off of them. Instead, to them, bathtime is regarded as playing around but only this time it’s in a little pool of water. 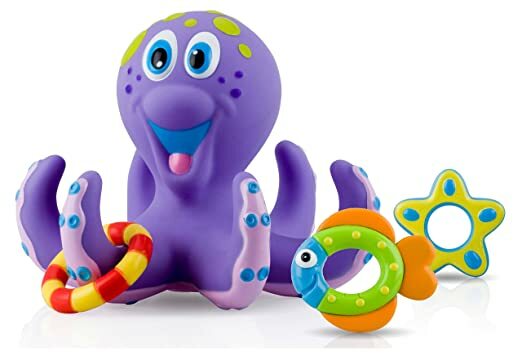 So, to make this time ever more fun and adventurous, we’ve added the Nuby Octopus bath toy. This octopus has tentacles that’re turned upward and a face that’s extremely welcoming and downright cute. The turnt-up tentacles can serve as a bathtime activity by having the rings that’re included in the toy set to be placed around a tentacle. This way, your 1-year-old boy can engage in completing a goal during play whilst mommy and daddy will make sure their son is all cleaned up and ready for that long-overdue nap. This toy also promotes and develops hand-eye coordination as well as motor skills (both fine and gross). The hoops are colorful which will keep your son engaged and intrigued. By throwing the hoops, hand-eye coordination will be developed early on. The octopus floats on the water, which makes bathtime all the more fun. This toy set is BPA-free. Toy can be a bit on the rigid side, so parents or guardians should always be near their son during play. Music is a valuable part of a child’s brain development. Your 1-year-old son can most definitely benefit from having a musical book is his little arsenal of toys. This musical toy book has more than 40 songs, sound effects and phrases as well as 6 nursery rhymes. This book will be highly entertaining to your son and has an interactive twinkling star. The different colors and buttons on this book will serve well to develop motor skills in your little man. Little Mozarts rejoice! Easy-to-turn pages that are also durable. Makes use of colors and buttons to stimulate your child’s creative side. Lots of bright colors and a character that will keep your son entertained. Nursery rhymes are limited to 6 songs. The pages could run the risk of pinching your child’s fingers in-between them. Cars are one of the things at the top of the list of toys that boys want growing up with. So why not get your son a Whisper Ride II stroller? It will provide both you, the parent or guardian, and your son with some fun and activity. Take your son for a stroll around the block in this car and watch him light up with enjoyment, all while you get some physical activity in. The Ride II will provide your son with a sense of sharing and social responsibility, not that he has his very own car. Comes with two cup holders to keep your son’s bottle and perhaps yours too when taking a stroll in the park. Has a built-in seatbelt for safety and a real feel. Patented Quiet Ride Wheels make for a lovely and quiet stroll. Includes a special storage under the car’s hood to carry all kinds of little treasures. Is easy to assemble and comes with a foldable handle as well as detachable parts. Can only hold a weight of up to 50 pounds. If there’s one thing that men all across the world need, it’s a flashlight! And why not get one for your son to get him started on his misadventures! Although this might be a flashlight, it’s also a valuable learning tool. This toy has everything needed to teach your son about colors and numbers. The colorful lights will teach him about different colors and provide him with interaction. This flashlight is a handy toy for educating a child on colors, numbers, animals, and sounds – as well as becoming your No.1 handyman in the house. Can be used as a standard flashlight along with the different colors that are on the head of the flashlight. Has a built-in shut off system in case the flashlight is forgotten on. 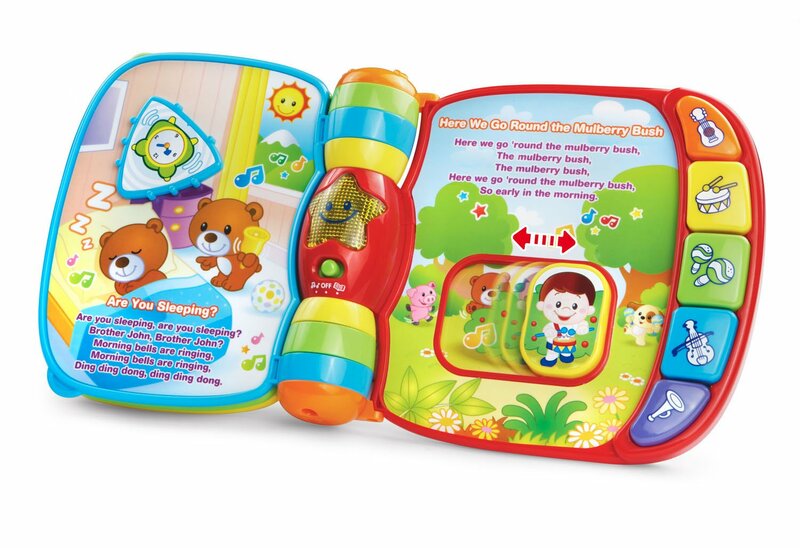 It has three buttons on the side that can play animal sounds, songs as well as an interactive game. The light can be somewhat over-stimulating to little children and toddlers, especially before bedtime. Not only is this a soft ball, but it’s a soft ball with all kinds of textures and bumps on it. 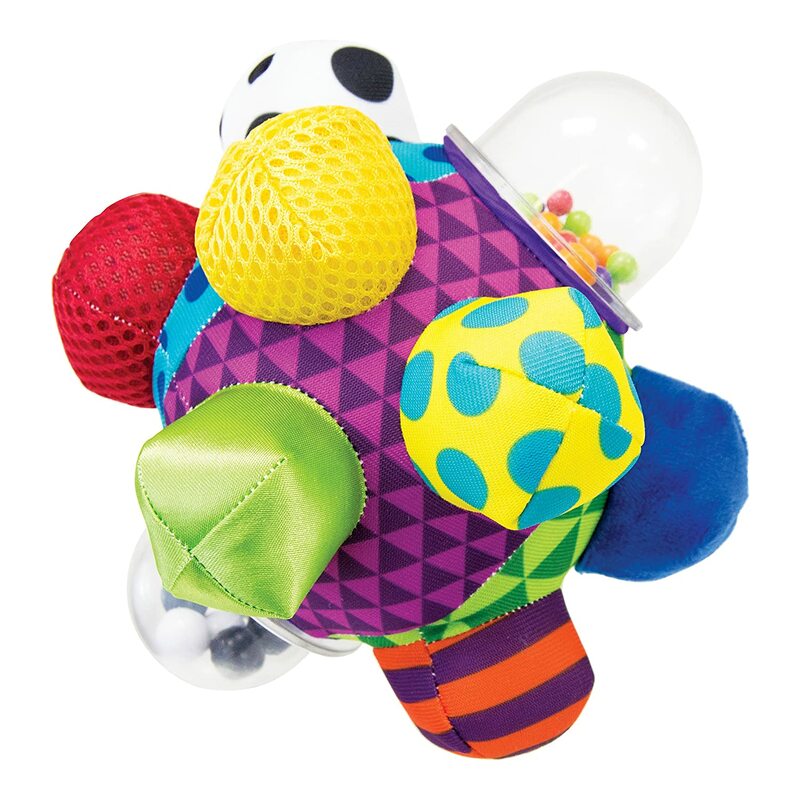 As the name implies, this is a ball and toy that is aimed at helping the development of your 1-year-old boy. Every bump on the development ball has a different texture than the one next to it. There are also two domes with plastic balls in them that could double as rattlers. This toy will do exceptionally well in developing your one-year-old son’s hand-eye coordination. The different textures help to develop a child’s tactile sensitivity and feel for objects. The sizes of the bumps are big and easy enough for a toddler’s hands to grip onto. 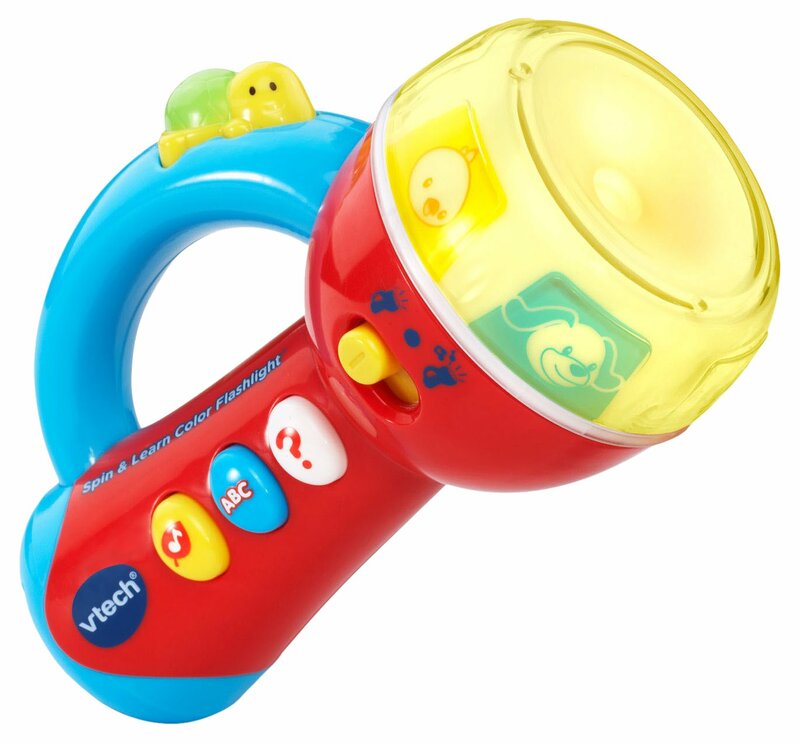 The rattles on the ball will keep your child engaged without causing an annoying noise. The ball isn’t washer safe and needs to be washed by hand. Here we have a stuffed toy that will surely snuggle its way into the heart of any toddler. This highland cow stuffed toy is made by the famous company Living Nature, who are known for making the softest realistic-looking soft toys in the world. This docile highland cow also moos when you press its hoof. Is super soft and ideal for nap time. It moo’s when you press the hoof, which will keep toddlers entertained. 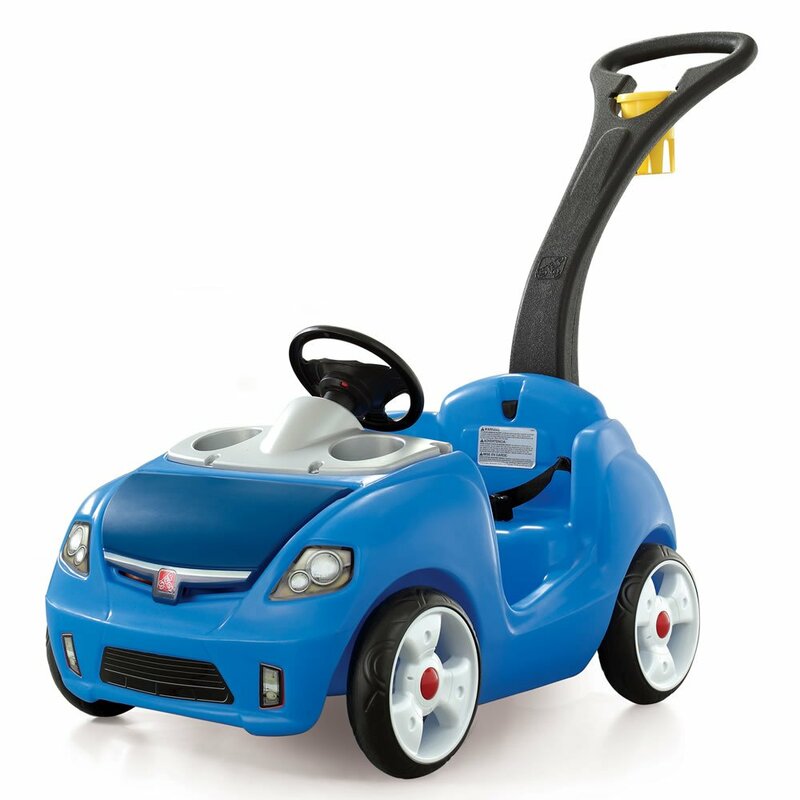 Here’s another great toy from the VTech company! This comes very close to what every little boy aged 1-year will want in a toy. The Turn and Learn Driver has a beautiful setup of different colors, a steering wheel, gear lever, side mirror, signal light lever, and 5 interactive buttons that play a sound whenever they’re pressed. 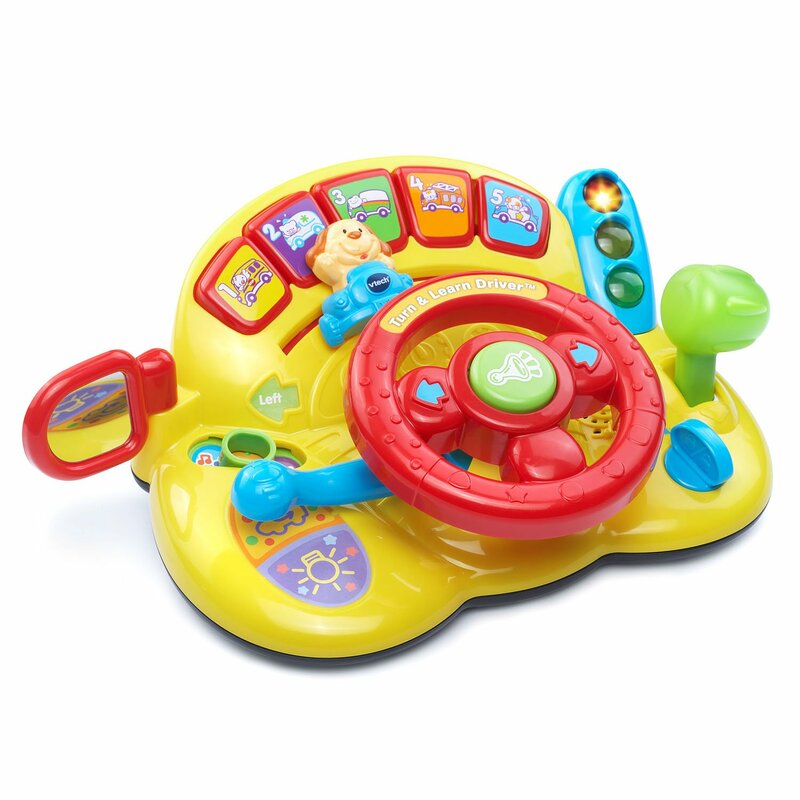 This toy will do well to help develop your child’s motor skills with all the levers and buttons found on the VTech Turn. It’ll also help him to develop his imaginative thinking by playing his own little game, going on adventures to who-knows-where, all while sitting in the same spot! The top 5 buttons teach about different animals and cars, which doubles this toy as a teaching tool. The steering wheel, gear and blinker lever, and various buttons will help develop your child’s hand-eye coordination and motor skills. The Turn and Learn has 3 different play modes that are focused around driving, music, and animals. It has a short battery life due to all the buttons, functions and sounds. This could be the next best thing to get those creative attributes to grow. 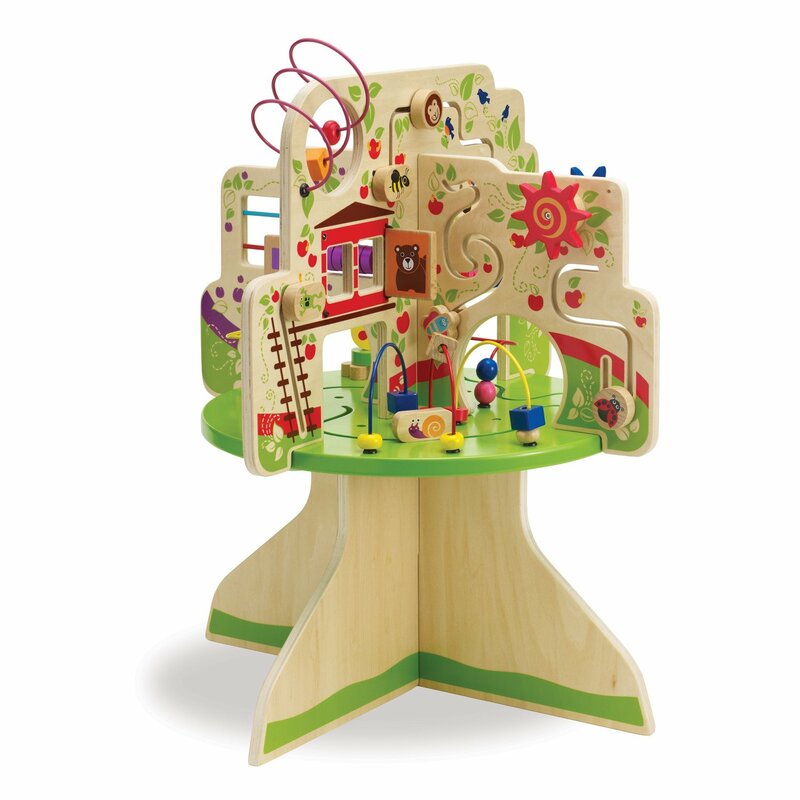 This fun little wooden “land” has an array of adventures made up of four quadrants with each having their own variety of animals and beads on loops. Additionally, the Activity Center play-set has three built-in tracks that have animal gliders on them along with colorful beads and spinners. The entire set is decorated with beautiful colors and objects like birds, leaves, and fruits. 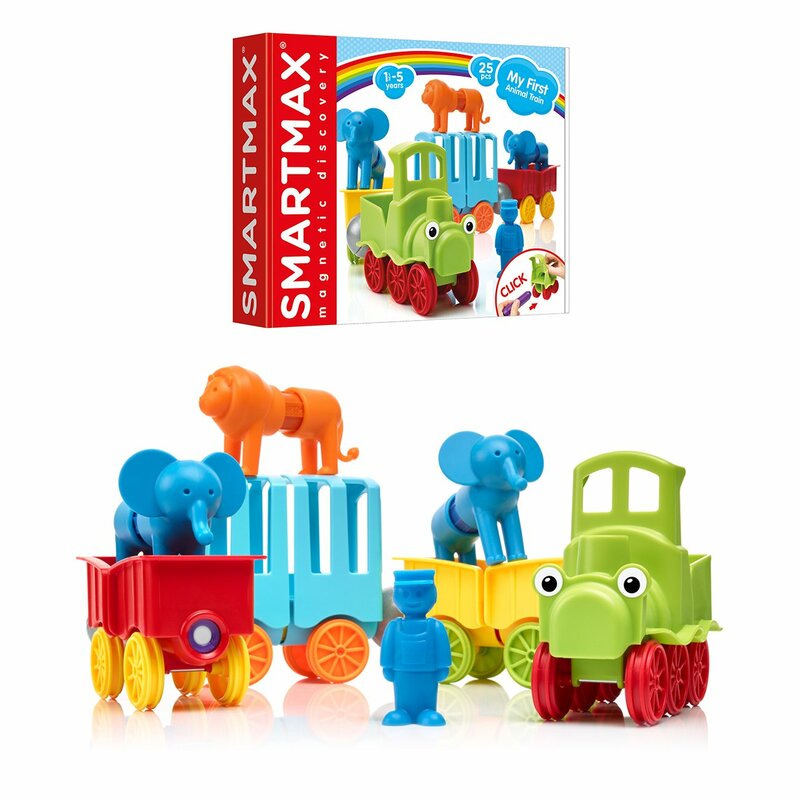 Every piece on this toy set is designed to help develop a child in some way, such as developing hand-eye coordination, motor skills, and their creativity. Your 1-year-old boy will be absolutely delighted! Develops motor skills and hand-eye coordination. Has four quadrants which could allow for another toddler to join the adventure. It could tip over if a toddler decides to climb it. Parent or guardian presence while playing is advised. Here’s a really great learning toy that your 1-year-old boy will benefit from. The Laugh and Learn Smart Stages Laptop has 3 different levels of play that can also be switched through manually depending on your child’s level of development. 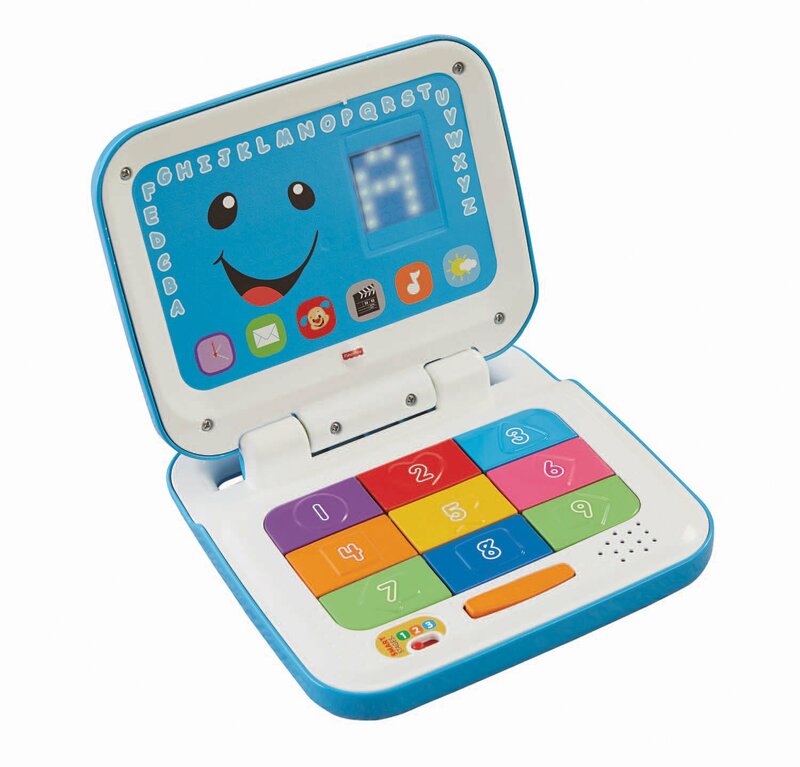 This laptop has a colorful numeric keypad with different shapes debossed on them which can help develop a child’s sense of feel or touch. The 3 stages of learning on this laptop are designed to be a form of progressive development. Every stage is as interactive and engaging as the next, so your son won’t get bored playing with it. Every stage becomes more challenging than the previous one which helps with development. The progressive stages of the Laugh and Learn laptop are targeted for the brain development of 6, 12, and 18+ month old toddlers. Has more than 30 songs, phrases, and tunes. The screen blinks letters, pictures, and words will visually engage your child and help them learn and develop their memory. There are 9 buttons and a toggle switch that will allow for some engaging playtime and help develop motor skills. It gives the parent full control over all of the songs, phrases, and tunes so that they can choose which is most appropriate for their child. The only language is English. There is no volume button or switch. 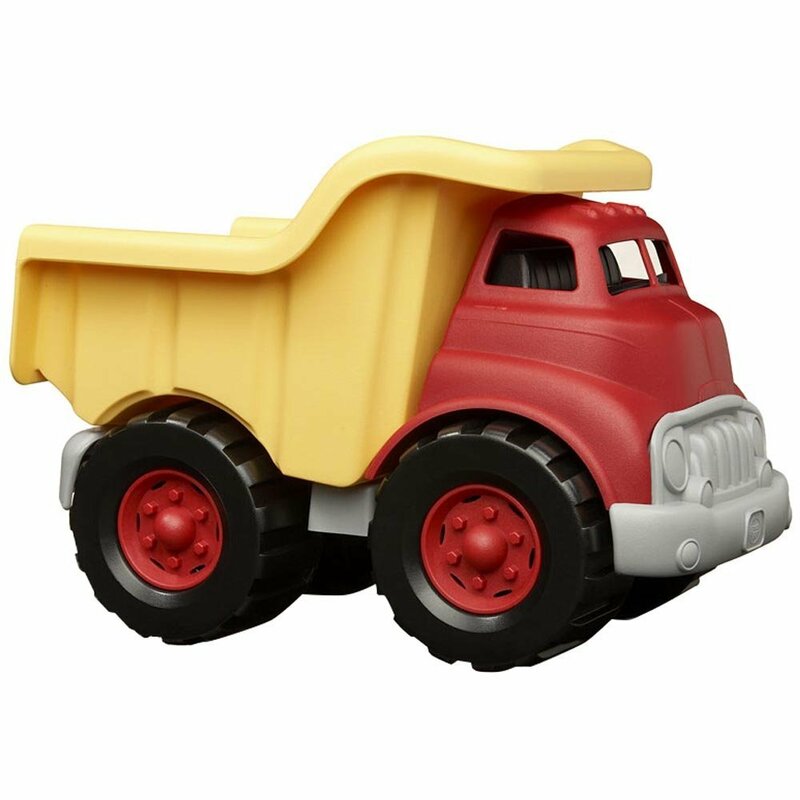 This toy dump truck is made from 100% recycled plastic and is free from any phthalates and BPA. This toy can be especially enjoyed if there’s a sandpit at home or when you’re on holiday at the beach. But even if what your 1 year old son plays with is inside the house or in the garden, it’ll still offer him countless hours of pure enjoyment. This is a green and environment-friendly toy that goes to show the company’s commitment to cleaner living. Made right here in the USA with high quality materials. No batteries are required to play. Free from BPA and other phthalates. The truck bed will tip if too much weight is added onto it. 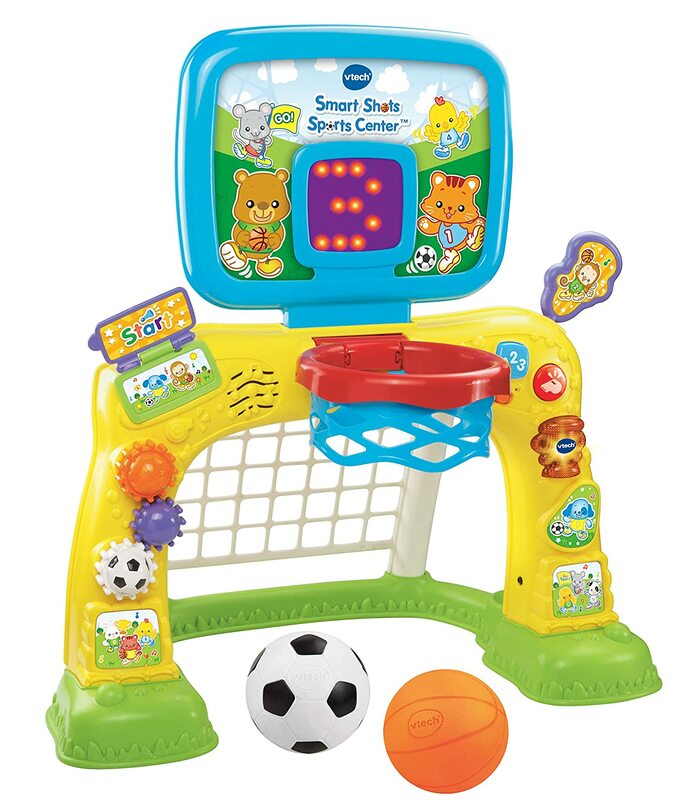 Here we have a toy that combines both basketball and soccer into one. If there’s anything on this list that I’d recommend to help improve motor skills, hand-eye coordination, and physical development, it would be this guy! The LED screen on the backboard keeps score, which will encourage your little man to go at it time after time and bump those numbers up. On the frame of the goal posts, there are buttons which will also allow for some interactive learning as well as physical development. Another benefit of the Smart Shots Sport Center is that it encourages playtime by lighting up everytime your son dunks the ball or scores a goal. The Smart Shots Sport Center offers both basketball and soccer as a physical activity. The LED screen lights up and plays music every time a goal is scored or the ball is dunked. The physical activity of kicking or throwing a ball develops motor skills and hand-eye coordination. Comes with more than 50 built-in songs to teach your child about shapes, sounds, and numbers. It runs on batteries and no batteries are included with the toy. I remember when I got my very first train set, and I know for a fact that I would’ve enjoyed this one just as much, if not more! This little train set is ideal as a beginner set, especially for a 1-year-old. Made from top quality wood, this set will keep you son entertained for a good amount of time! 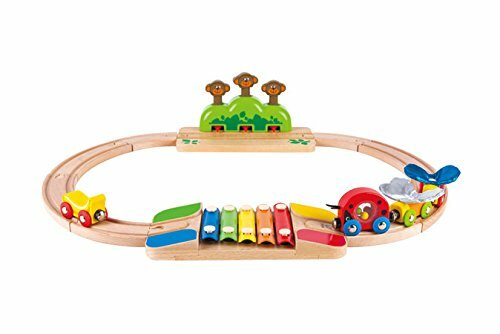 The set includes a xylophone bridge which chimes whenever the toy train crosses over it. Opposite the bridge is a little box of jumping monkeys which pop out each time the train passes by. The toy set is made of high quality wood, which makes it durable. Each train cart is a different character than the next. The monkeys need to be reset each time they pop out. This 25-piece toy set introduces toddlers to the world of magnetism, and does it in a way that is both safe and fun. This colorful toy set has three animals; one lion and two elephants. It also includes a train driver and a train with three carts — one for each animal. The magnetic parts of the animals are large and click easily together, which is especially helpful for when a toddler plays with it. This set could also encourage creativity and develop hand-eye coordination, especially when it comes to taking the animals apart and putting them back together. Made up of vibrant colors. The animals have interchangeable bodies that can be mixed and matched. The magnetic parts are extra-large and snap into place quite easily. If not careful, the magnetic parts could go missing. There are many great toys out there – especially for 1-year-old boys – which can be fun for your children to play with. Keep in mind however that toys should be safe, compliant with the latest safety standards, and large enough (small rounded shapes are a big no-no) to avoid any accidents. On top of that, toys should also provide benefits from a learning and skills development standpoint as well. Finally, you should always have a family member close to your 1 year old son while he plays with his toys, just to be on the safe side. 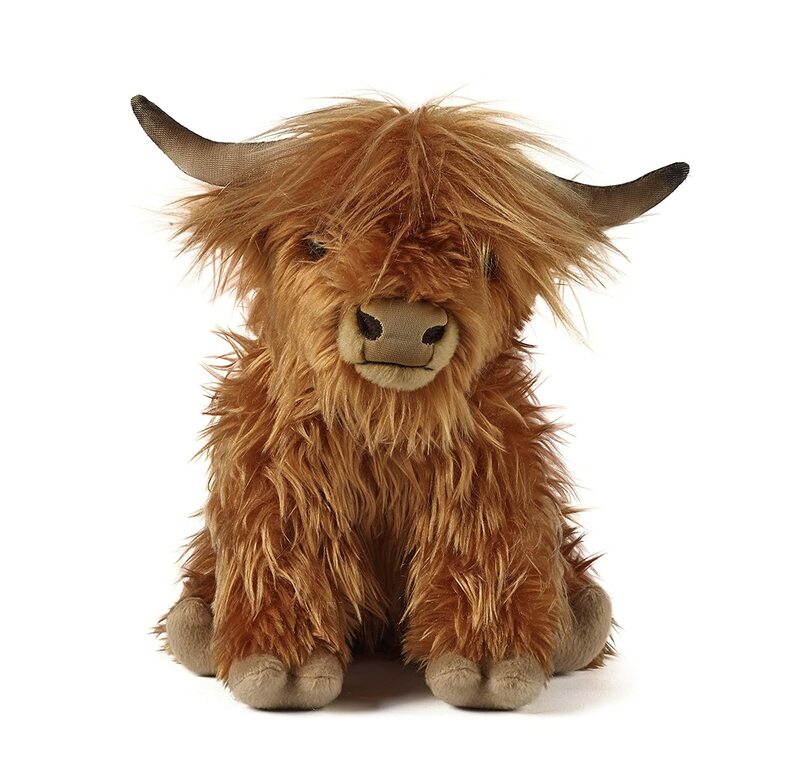 Whether the little “rascal” picks a toy sporting a variety of colors, ones with multiple sounds to dance to, or even the all-natural highland soft cow, you’ll be rest assured he enjoys his time with these toys in a 100% safe manner. Feel free to review our table below to compare each toy with the next.